If you are looking to swim with dolphins and live a multisensory maritime experience on a transparent kayak, Nature Connection is for you. The Nature Connection program seeks to strengthen the connection between the human being and nature through dolphins. Its essence is centered around the origin of man and his first bonds with the elements of the earth and the ocean. From its origins, man has always tried to be an active part of nature, since his survival depends on it. In the beginning, man began to accept himself as part of nature by observation, supported by the knowledge from his senses and guided only by his curiosity. Nature Connection consists of that: observation, senses and curiosity. What is the Nature Connection experience? On the way to the habitat, the video played in the van gives you a first sense of the sounds and colors of the ocean and marine life. Once at the habitat, you will be surrounded by music and aromas. 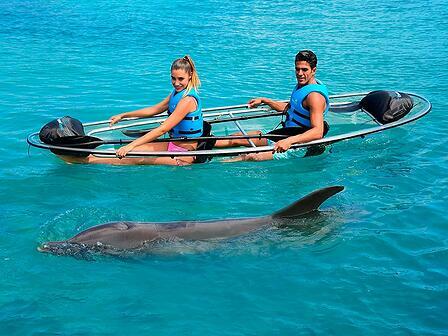 During the activities inside and outside the water, you will observe and understand the natural curious behavior of dolphins, similar to that of humans. This connection with nature and the dolphins is definitely a first step towards our commitment to practicing and promoting the protection of mother nature. In addition, it is beneficial for our health, as it is proven that the rhythmic sound of sea waves lowers blood pressure and helps create an atmosphere of relaxation and tranquility. Upon arrival, Delphinus will give you a beautiful bracelet made of natural elements. Then, for 45 minutes, the visitors participate in activities within the habitat during which the dolphins’ behaviors can be observed. 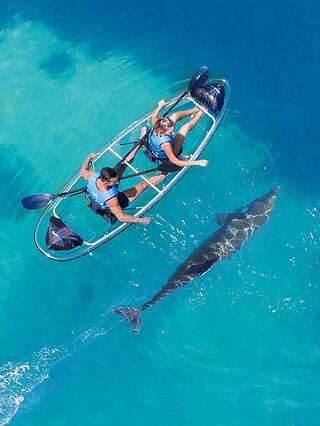 The tour is on a translucent kayak, through which you can observe and perceive the waters of the ocean and the dolphins in a very different way. 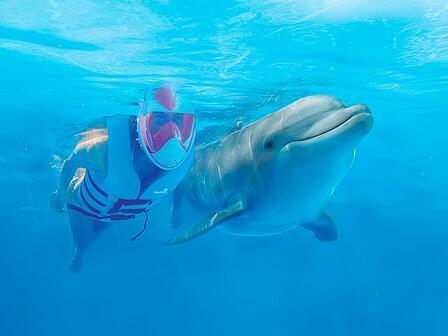 You can also snorkel with an integral mask that allows you to breathe through your nose and mouth without using a tube, which will ease your appreciation of the flora and fauna that beautify the home of the dolphins. You will also have the opportunity to observe how the dolphins behave under certain circumstances while swimming freely around them. Our animal care specialist will explain in detail some of the characteristics of our marine mammals and you will discover the impact of the human being on the dolphins’ natural environment, as well as on their well-being. When getting out of the water, the habitat managers will bring you a robe, as well as a fruit infusion that will help your hydration and concentration until you get to the photo and video room, where you get to experience the adventure all over again. 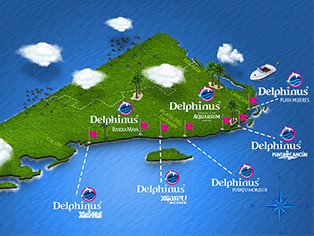 Out of concern for preserving our species, at Delphinus we managed to create this concept that we want to share with you. If you are looking for close experiences with nature, book Nature Connection and be the first to live this adventure.